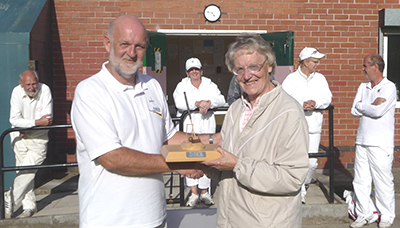 Bob Thompson being presented with 2010 Bury Handicap Trophy by Bury Chairman, Barbara Young. Bury club promoted their first-ever Coronation Park tournament, owing to a mixup about dates forcing a move from Heaton Park. As Coro has only two lawns this restricted the entry to eight and the format chosen was all-play-all, seven two-hour 18-pointers, base 8. In spite of intermittent rain some very good croquet was played with a gripping conclusion. In the final round one contestant had already five wins and three others four. At the end there was a three-way tie which had to be broken by hoop count. Malcolm Daines (Huddersfield, 5) had zero net, Betty Bates (Fylde, 16) +39 and Bob Thompson (Nottingham, 9) had +53 and was thus declared the winner. Fourteen entrants (handicap from -1.5 to 8) competed to Egyptian format beginning with a random draw. The first day ended with David Walters and Alan Mayne having each won for out of four and on the same rating. The Sunday play begin by Walters beating Mayne while on the second pairing Andrew Winn beat Dave Nick. Walters then lost to Nick while Mayne beat Winn. The losers in these interchanges could not quiet assemble enough points, though Nick tried hard by beating Paul Rigge, leaving Mayne the winner. New boy Matt Holmes began nervously but found his feet on the second day winning three games to reap a net 46 handicap points. Paul Rigge won the Heaton Park Advanced Tournament. Thirteen players from ten clubs contested the event over two days to an Egyptian format. At the end of Saturday Andrew Winn, Paul Rigge, Jerry Guest and Robbie Dodds were in the lead each with three wins and one defeat. On the Sunday Winn and Rigge remained the chief contenders and at the end were inseparable, leading to a shootout at the peg which Paul Rigge won at shot 7 (2-2 after five).